The Charedi approach to getting married is sick. Especially in Israel. There is not a doubt in my mind about that. It is sick for a variety of reasons. But primarily it is sick because it is based on money. And this sick phenomenon is perpetuated by Roshei Yeshiva. I believe this is the unvarnished truth.Which was clearly described in an interview by David Lichtenstein of Miriam (Mimi) Levitin, a Shadchan (Shadchanta?) in Israel for 13 years (Available at Matzav). How does a young man and woman in that world get married? First it should first be noted that in this world, there is no such thing as a young man and women meeting without an intermediary. Which is usually a Shadchan. What is the first thing that is looked at? The answer is money. A discussion does not begin until the financial situation is settled. This means that depending on which Yeshiva in which a young man attends - and how much he is valued - that will determine how much money he is worth. 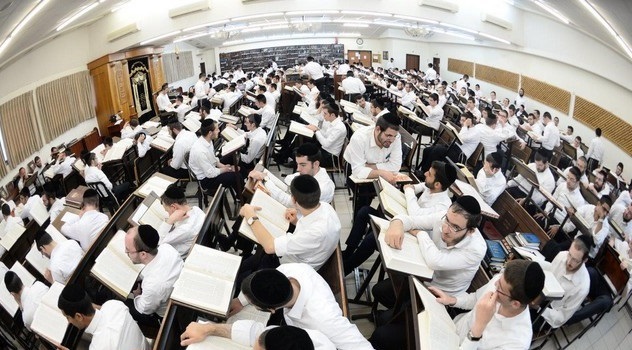 So that a top student in one of the top tier Yeshivos (like Chevron or Ponevezh) can easily fetch upwards of 800,000 NIS (just over $220,000) for purposes of buying a Dira (living quarters – usually a condo). If he is not in one of those top tier Yeshivos the going rate is about 400,000 NIS. In many cases, if the money isn’t ‘ponied up’, it is a non starter, The young couple never even meets! The fact happens to be that Roshei Yeshiva are integrally involved in the process. For obvious reasons. They know who their top students are and in those cases they are the driving force in Shiduchim. It is they who make the demands for that kind of support. And he usually gets his price! I don’t know how others might feel about this. But unless he pays it out of pocket, I would call it extortion! In one instance described by Mrs. Levitan where parents agreed to finance the purchase of their chidlren’s Dira - the details were left until things got serious. When that time came the young woman’s father offered 600,000 NIS. The young man’s father shot back something to the effect of ‘Is that all?’ ‘A Dira cost an average of 1.2 million Shekel.’ ‘I am putting up 200,000.’ ‘ Where is the other 400,000 going to come from?’ ‘I am not willing to allow my son go into debt.’ The Shidduch was called off – right at the point where the couple were about to become engaged. I wish I could say that this is the first time I have ever heard that kind of story, but it isn’t. It happens not only I Israel, but in the United States too. I know a fine Mechanech that has long ago gone into serious debt so that his daughters could get the Shidduch they wanted. In another instance Mrs. Levitin described a wedding she attended where the father had a very difficult time raising the money to pay off this extortion. He collapsed from a heart attack at the wedding! (He survived.) Now there is no way of knowing for sure whether the stress this father had from his experience was the direct cause. But I’m pretty sure it didn’t help. This affects the young men themselves. If they are constantly bombarded with how ‘valuable’ they are as Talmidei Chachamim – and get that backed up with high financial demands from potential fathers in law, they can easily end up with swelled heads that might end in their never getting married Mrs. Levitin described the case with one 31 year old young man who is extremely well thought of and is now so high on himself that he won’t budge until he gets his price. As far as I’m concerned, this fellow is unworthy of marriage in any case. But he got that way because of how he is valued. As noted in the interview, how can a boy who extorted that kind of money from his father in law sit at his Shabbos table knowing that he has financially ruined him? Where is his conscience? I agree with the assessment of both Mrs. Levitin and Dovid Lichtenstein that this fellow is far from the ‘diamond’ he was touted to be. And how do their Roshei Yeshiva that are immersed in these things live with themselves? I don’t know where most Charedim get that kind of money. Especially if they have more than one daughter. Which is highly likely since the average Charedi families is usually pretty big. So what ends up happening is that only the truly wealthy can afford to ‘buy’ this Shidduch for their daughter. And this doesn’t even speak to the ‘average’ young man who is not top tier and does not attend a top tier Yeshiva. They are still going for 400,000 NIS! I cannot imagine the pressure that takes place upon these families when their children are ready to get married. Where is the average Charedi – even working ones – get that kind of money for their daughter and her sisters eventually? The answer is they beg, borrow. or – dare I say it steal - to get it. Beg by accepting charity; borrow from as many Gemachs (free loan societies) that they can; and steal by forever owing those loans to one Gemach to another! And I doubt that they ever get enough to cover all of their children. That said, I know that most young Charedim do end up getting married one way or another. But at what price? Both in dollars and in mental health? And how many young women remain single because their parents simply can’t pay for it. I am so happy that I am not a part of such a system. My own children got married (3 daughters and one son) without any extortion from anyone. Money was never an issue. And those that know my children and their spouses will attest to the fact that they did quite well. I wish only that type of success on all of Klal Yisroel. May no one ever do worse than I am extremely proud of my children and their spouses. Big time! In my world - although using Shadchanim is widely accepted as well - young people can meet on their own and make decisions on their own . This does not mean they don’t discuss their dates with their parents. Good parenting will inevitably result in children trusting the wisdom of their parents as part of their decision making process. But at the end of the day, it is their decision. As the title of the Matzav piece indicates, this is a system that should have collapsed a long time ago. It has been going on for decades! But it hasn’t. It is still going strong. Which begs the question, how is it even possible for this system to survive into the future as the population increases while the income remains the same? Beats me.